Clever, little, furry baby raccoons. Entertaining to observe. Their tiny nimble-fingered paws rummaging through anything they can forage. These bandit-masked beasts are everywhere. Most commonly seen at night, raccoons are nocturnal foragers that will eat just about anything! Insects, eggs, plants, frogs, crayfish, and even garbage. They are lightning quick to grab whatever suits them and will actually gorge themselves in the spring and summer to prepare for a sleepy winter in a crowded den. Mother raccoons give birth to anywhere from 1-7 cubs. 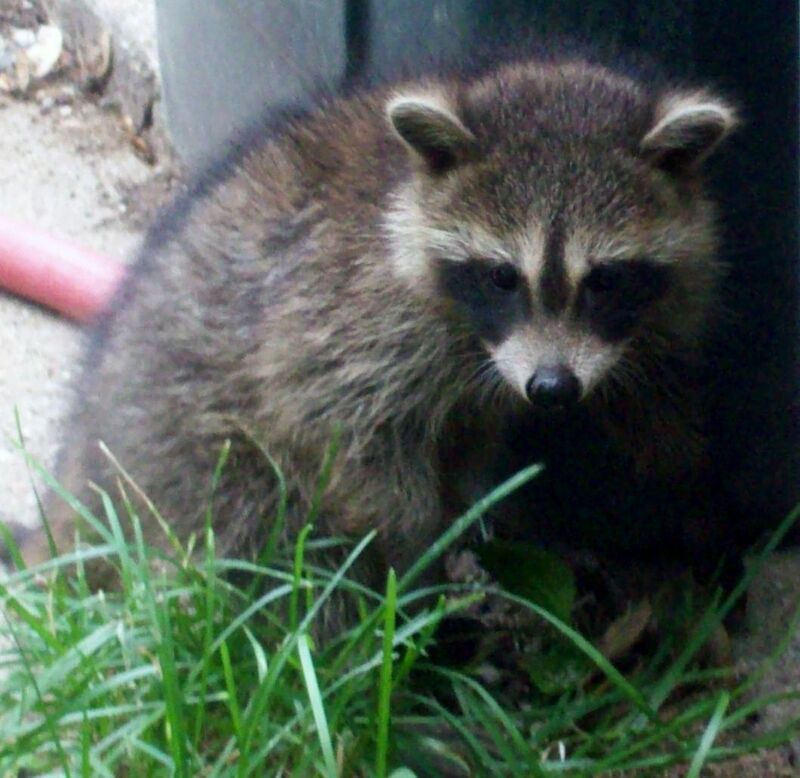 Raccoons will weigh from 4-25 pounds, and live about 3-10 years in the wild. A neighbor brought two of these babies over for us to meet. 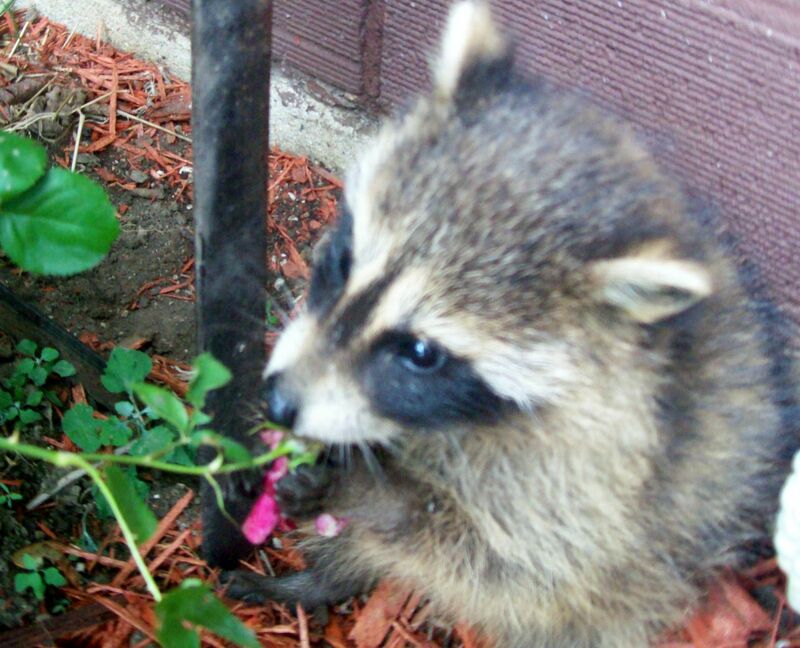 I have scoured all the resources I can find and have not been able to find a humane way to keep wild raccoons from ravaging garden beds. An electric fence is an option, but I would worry about pets and small children playing around the garden. Some people have had limited success with owning large dogs to chase them out, but their have also been cases where dogs were actually killed by raccoons. These garden guests will certainly wear out their welcome if they stay longer than a moment or two! – The raccoon’s scientific name, Procyon lotor, means “washer dog” although it is a closer relative to the bear family. 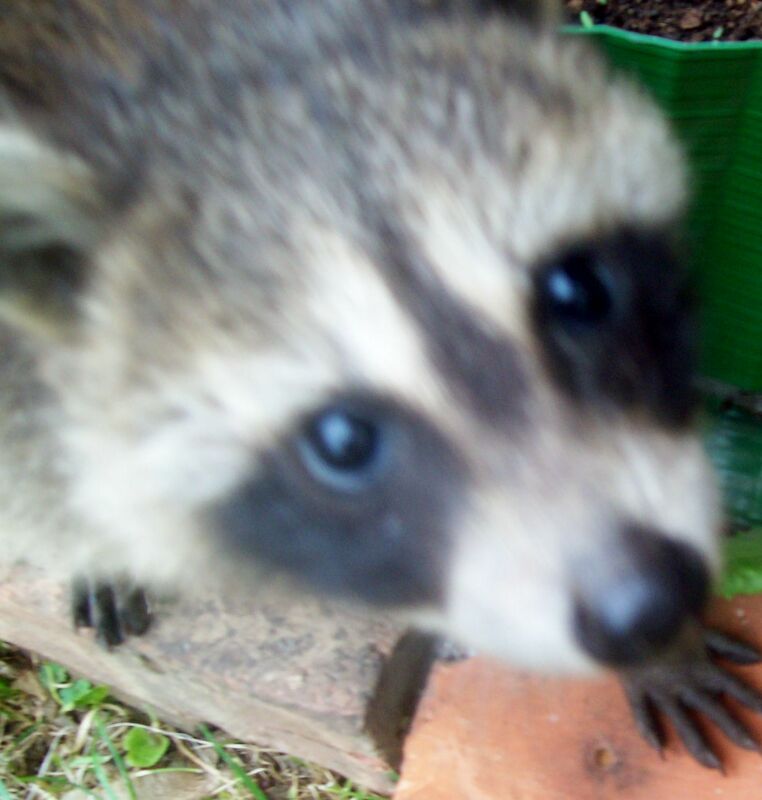 – Population densities of raccoons in urban areas can be 20 times higher than for raccoons in rural environments. – Raccoons have a large array of vocalizations. They purr, whistle, growl, hiss, scream and even whinny. – Raccoons have been kept as pets (President Coolidge and his wife had one named Rebecca), and while young, seem happy to be in human company. As they mature, especially during mating season, they can become increasingly destructive and aggressive. – A raccoon’s hands are so nimble they can unlace a shoe, unlatch a cage and deftly retrieve coins as thin as dimes from your shirt pocket. 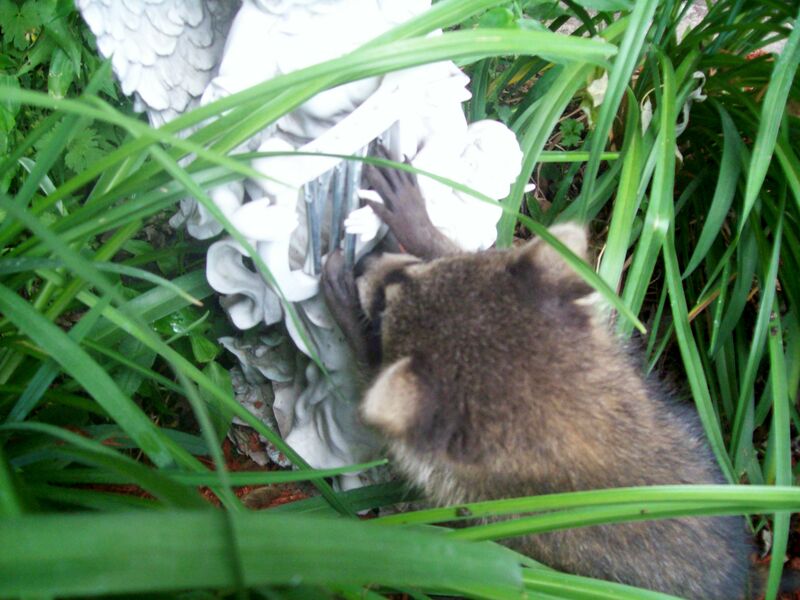 Posted by Createityourself on June 5, 2012 in Plants and Gardening, Uncategorized and tagged baby raccoons, garden, gardening, nocturnal, pets, photos, Plants, raccoons, wild animals. Huh! I never knew any of this! When I start my garden I will definitely have to watch out for raccoons! Yeah, raccoons can be tricky little buggers! I’ll have to watch out for them next year when I have my garden! I picked up a critter control powder made primarily of pepper that’s supposed to keep raccoons at bay. I was out guarding my front yard garden recently and saw a raccoon cross the street and go down my driveway two different nights. If it’s eating my garden, I haven’t noticed it. I’ll let you know if the pepper works. It’s OK for organic gardens. Yes, please do let me know how the powder works out. Thanks! I’m a pacifist, so I hope the experience isn’t too traumatic. Sounds good. I will have to look up have a heart traps. Thanks for commenting! We just have rabbits. I need to find the picture of the baby bunny that our cat brought home. It was alive. She carried it like a baby and dropped it on the porch for us. My daughter rescued it and returned it to its mama.